Charles Kickham designed the stone and masonry Benevolent Irish Society (BIS) building in St. John's. However, John Coleman, William Kelly and the members of the BIS actually constructed the building. Benevolent Irish Society Building is one of the few surviving Second Empire style masonry buildings in Newfoundland and Labrador. The structure was erected in two phases, the first being the construction of St. Pat's Hall between 1877 to 1880. The Great Fire of 1892 later led to the rebuilding of the structure's interior. St. Pat's served as a Catholic school for many years, but the hall quickly became overcrowded. In 1906 the BIS built O'Donel Hall to provide extra schooling space. They named the new extension after Right Rev. Dr. James O'Donel, the first Irish prelate to lead a Newfoundland congregation. In 1906 the third floor assembly hall became the Nickel Theatre and the BIS club moved to the ground floor. The Nickel was one of the first North American theatres to show the "new" silent films. 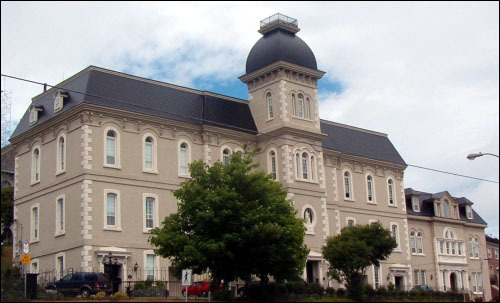 The building continued to be used for educational purposes until 1985 when a decline in student numbers, combined with new Catholic facilities on Bonaventure Avenue, made the old building redundant. Formed in 1806, the BIS was one of Newfoundland's first charitable organisations. The association was nonsectarian; the only qualifications for membership involved having close family ties to Ireland. Of the initial BIS executive of six men, only one, Henry Shea, was Roman Catholic. Throughout the nineteenth and into the twentieth centuries, many of Newfoundland's political, economic, social and religious leaders were associated with the BIS. Newfoundland's first prime minister, Philip Francis Little, was president of the society when he became prime minister in 1855. In July 1998, the BIS announced their intention to sell the complex to developers Kevin Nolan and Robert Hall, who have since transformed the building into several condominium units. In recognition of the prominent role played by the Benevolent Irish Society in Newfoundland's history, their building became a Registered Heritage Structure in April 1990. Image and article updated July, 2004. Also view the Benevolent Irish Society (BIS) Building Registered Heritage Structure, and the Benevolent Irish Society (BIS) Building - City of St. John's Heritage Site on the Heritage Foundation of Newfoundland and Labrador web site. The Newfoundland and Labrador Heritage Web Site has on its site only a portion of the registered heritage structures in Newfoundland and Labrador. To view a complete list or search for a particular structure visit the Heritage Foundation's Property Search page.